“Illness is often viewed as a battle, a war, a sad, and tragic thing. I’ve replaced the war analogy with a work analogy. Illness is work for me. Cancer is my second job. I have scheduled times I have to go to the hospital. I go. I do the work. I come home. It’s hard work but cancer has become a part of my everyday life and I certainly don’t think of my life as a battle or war being had. I agree with Ric, the war analogy doesn’t work for me. When I was first diagnosed, it freaked me out that my cancer didn’t feel like something to fight against. In a series of dreams, my cancer was pearls and gems dangling from canopy beds and hung on long clothing lines. I always awoke feeling that my cancer was painful and unwanted, yet majestically important. These dreams have long vanished, as has the royalty of this malignant routine. But, I still feel that cancer is a part of my body to work with rather than fight against. Cancer is smart. I want to work with its intelligence so I can outwit it. Do you have images for how you view your cancer? Is it a war, battle, fight? 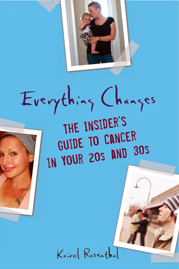 Has your perception of how you describe your cancer changed from when you were first diagnosed? i love your new website! keep the writing coming… this was such a thoughtful post.